Imagine a transportable solar power station that tracks the sun like a sunflower and cools itself by pumping water through its veins just like a plant. The Sunflower Solar Harvester, developed by the Swiss company Airlight Energy, can do all that and in the process produce heating, desalinated water, and refrigeration from the 12kW of energy it provides from just 10 hours of sunlight – enough to power several households. Aimed at off-grid communities in remote regions, the all-in-one 10m-high system — whose components can be transported in a single container and reassembled in situ – has been in development for more than two years and could be on sale as early as mid-2017. He said the system will appeal to those that have multiple requirement and a lot of sunlight. Nevertheless, off-grid regions from as disparate and far-flung places as North Africa, the Middle East, the United States, Chile and Australia have expressed an interest in the technology. “Then there are those regions that have good solar radiation and high fossil fuel prices such as Japan which is not an obvious place for this sort of system, but where we see a lot of potential,” Ambrosetti said. At the core of the technology are IBM-designed water-cooled solar panels whose microchannels carry away the heat produced by the reflector mirrors. The flower-like array of reflectors concentrate the sun’s energy more than 2,000 times onto the six panels which each hold 25 photovoltaic chips. The heat is carried away by the water at a rate that keeps the microchips at their optimum temperature, making the Sunflower Solar Harvester one of the most efficient solar energy producers around. Developers say that it needs just a quarter of the panels to produce the same amount of power as conventional systems. Everything about its design is aimed at bringing down costs; what would normally require large and expensive solar mirrors is achieved with metallised foil of the type found in food packaging like potato chips. The concave shape of the reflectors is kept in place by a light vacuum, a useful failsafe if the cooling system fails. Rather than overheating the solar cells, the operator can simply release the vacuum to diffuse the reflected sunlight. 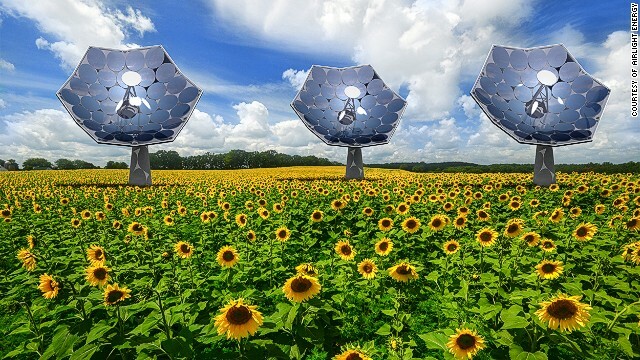 While the company is not claiming the technology will completely replace fuel-powered generator sets — which can often produce 10 times the power of one solar sunflower — Ambrosetti said it could be possible to run some remote facilities with an array of the parabolic mirrors. “You would, of course, not have just one Sunflower but several so you can scale it up quite easily,” he said. “Hospitals, for instance, are quite energy intensive — if you needed 1.2mW to run a hospital you’d need 100 sunflowers. The system produces around 20kW of thermal power from 10 hours of sunlight, enough say the developers to power a low-temperature desalinator in coastal regions. Sea water vapor would pass through a polymer membrane and condense in a separate chamber, to produce as much as 2500 liters of fresh water per day. Ambrosetti said the cooling system drew its inspiration from nature where vascular systems operate to carry away excess heat. Ambrosetti said the system was likely to appeal commercially to green residential and commercial developments. “It’s biggest potential is in making integrated systems where you can provide several things at once such as heating, cooling and electricity,” he said.